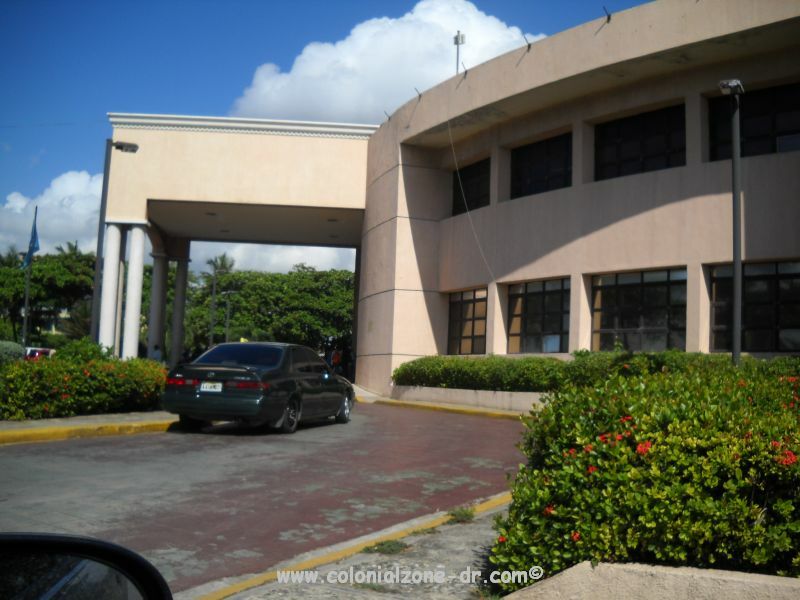 Welp, I went to renew my Permanent Residency/ Residencia Permanente so I can live in Dominican Republic legally on August 17 (no idea why it is called permanent when it always needs renewed). I was shocked with the new laws. They came into effect the beginning of the month. I knew things changed for getting residency but I did not think they changed that much to renew residency. I was so wrong. Last time I went to renew I just needed to pay the money, leave a few copies of my documents and wait for the new card. I think it was $2500 pesos. This time no one had me prepared for the new stuff. No ex-pat forum I checked had the new changes correct. 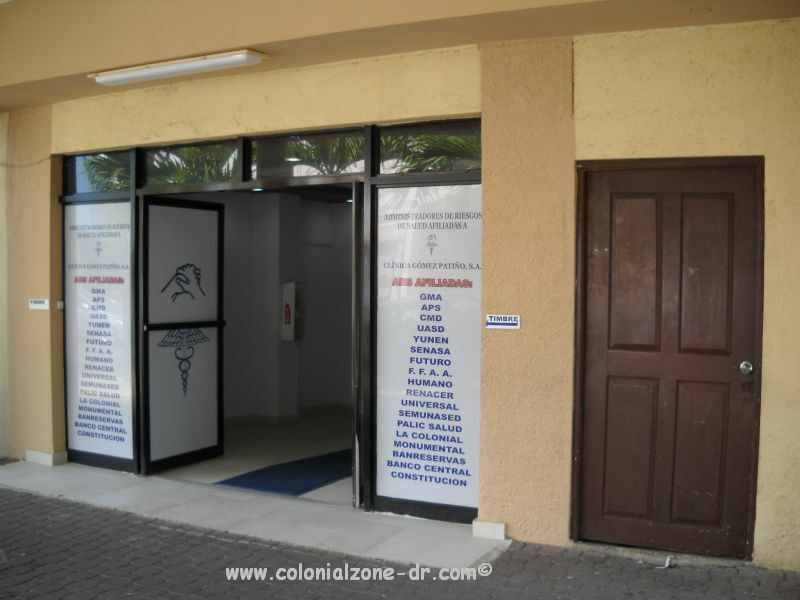 Even the Dominican Migracion site did not have the new laws (the people working at migration said to not pay attention to their web site). Well, I was so shocked and did not save up enough cash in my renew residency cash stash that when they told me about this new stuff I stood there and cried. I tried to not cry but it was such a shock and more than triple that what I expected to pay. Plus I would need the services of a lawyer. They told me that I should do the medical exam at the cost of $4500 pesos (right now the exchange rate is around $39 pesos to $1 dollar), because it takes about a week to get the results and see if you can get residency. I know they check for drug use, TB and whatever else. So first I had to pee in a cup. The nurse lady kept the bathroom door open I guess so I didn’t sneak someones clean pee into my little bottle. It is not easy trying to hit that cup especially when someone is peeking at you. Then came the blood test. I’m not real good with needles and blood but I did good. I wish she did as good as I did. There was a giant bruise and mark in my elbow pit for a week! While I was waiting for my taxi I called my lawyer, Wilson Rood and Associates to tell them what happened. They did not believe me about what I had to do for my residency so they came there to check. It was correct. They were just there 2 weeks before and these laws were not in effect. Then they gave me my receipt and the guy that worked there gave me a number to call in 6 days to find out my results. I had to go to another place for the chest ex-rays. I called my taxi (JC Taxi) and we were off to the place. I got my Xrays, called the taxi and went home. I was finished for now. I had to find a Guaranteer/ Garantía (a Dominican citizen to take responsibility for me), get a good conduct report from the police, and make bunches of copies and get all legalized. I was a bit stressed. All this paperwork, running around and the extra MONEY I had to come up with. Thank goodness I have great friends. I got my Guarenteor, Declaración de Solvencia Economica $3000 pesos then paid for the notary $500 and $330 pesos (thanks Fortuna & Asociados, Santome, Zona Colonial – 809-224-6862 and 809-687-2080). Then the good conduct papers. I did not have to go to the police and do it myself. Wilson Rood and Associates did that for me, the notary cost $330 (the $330 pesos has to be paid at Banco Reservas). So now I have these documents all done. Have to make 4 copies of each document. My passport, my cedula (Dominican ID), my residency card, all the copies of the witnesses cedulas, the guaranteer and his property, and the form paper (cost $100 pesos). I got all this in order, copied, copies for me. All set to go and hoping my medials stuff passed inspection (I called the number they gave me to check on my medical stuff many times and there was never any answer). So now it is early Monday morning September 3rd. I was heading back to Migracion for with all my documents in hand and all my cash in my pocket. I first traded my cedual in for a pass card. Then went and paid for the face pictures they wanted. I go these in the passport office on the other side of migration for $150. Nasty looking pictures but I do not care. I just want this over with. I go inside to a window, called a caja here and ask what i need to do now. They asked for my medical receipt. I did not have it. I left it at the ex-ray place. When the ex-rays were done I asked if there was anything else. They said no. I said do I need anything else. They said no. So I left. They did not tell me I needed to get my receipt back from the. So anyhow, I had to call the taxi and go back to the ex-ray place and get my receipt. Thank goodness they still had it. They had many of them. I guess I am not the only one that did not now I had to keep that receipt. I went back to Migracion and back to the window. They told me I had to go to the medical office, located inside the Migracion office, and give them my receipt. Then I had to wait for them to find my records and stamp the receipt that I passed or failed. I needed to go to the Procuraduria Office outside the back door to stamp a document that I already paid for at Banco Reservas. They did his just fine but someone locked the door back into the Migracion office. Everyone was trying the door. It looked like it was some TV joke program. I did not even try the door. I walked around through the passport side and back into the office I needed to be in. I had to get the form to fill out, $100 pesos. Filled it out then back to the window to get fingerprints on the form. Then had to go and get copies, $50 pesos. Back to the window and she looked at all my documents and put one bunch in the roper order and gave me paper clips and told me to get the other 4 copies in the same order and get a few more copies, $40 pesos. Went to a table and arranged all my stuff in the correct order then back to the same window. She looked at them again, stapled them then told me to go to the original window in a half hour to check and pay more cash. I waited, talked to a security guard, helped a man that was doing his stuff the first time without a lawyer at his side. I remember when I did my permanent residency all alone. It was so confusing. Funny how that Migracion building brings out the tears in people. After a half hour I went back to the window, the lady had my file. She said all was good and I needed to pay for the residency $4000 pesos and if I wanted the VIP service (my residency card today, $1000 pesos) I could pay for that also. I was not going to pay for VIP. It will be cheaper to get a round trip taxi, under $350 pesos, than to pay this money. I opted to return for my documents. I traded my pass in for my id card and called the taxi. So, now I need to return on the 10th and get all m blue residency card. All this cash. All this time. A little bit of tears. A good learning experience. All is good. Next time I will try and go for my Citizenship then I will never have to worry about another renewal. This is a copy of the new requirements for right now. This could change tomorrow. One never really knows. 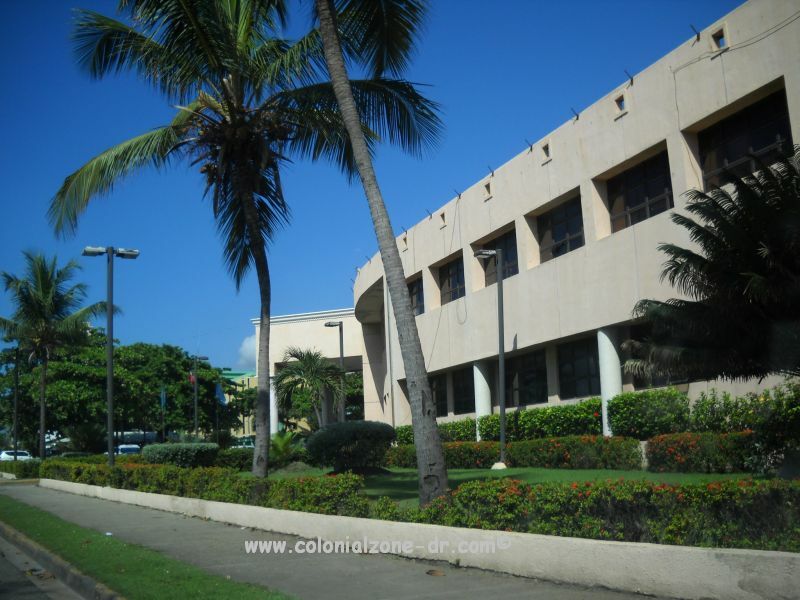 Just a Story cost, dominican, dominican republic, ex-pat, law, lawyer, legal, migracion, migration, permanent residency, renewal, residencia permanente. permalink. Thanks for the very good information about living there. I now want to visit and learn about the culture.. I hope you can contact me when you have another blog. I was just at immigration and the requirements appear to have changed. The paper they gave me shows that #8 on the above paper is now changed to not include a Guarentor, instead only the letter of Economica solvency. So glad they changed that. Just wish I did not have to pay all that extra cash for the documents. I hope they change the doctor stuff soon also. Thank you so much for all the useful information. I will be traveling to DR in January to renew my permanent residency. I’ve looked on all the official websites and thought I was all set to just pay the fee. I had no idea that I would have to do another medical exam and turn in more documents! I wouldn’t have been prepared to pay that much. Thank you! I head they might be changing back to the original way to renew. Not sure whats happening from day to day but at least its good that you will be prepared incase you have to do all the crap over again. Wow, what an ordeal. Sounds like you were too late in renewing your residencia like I was. 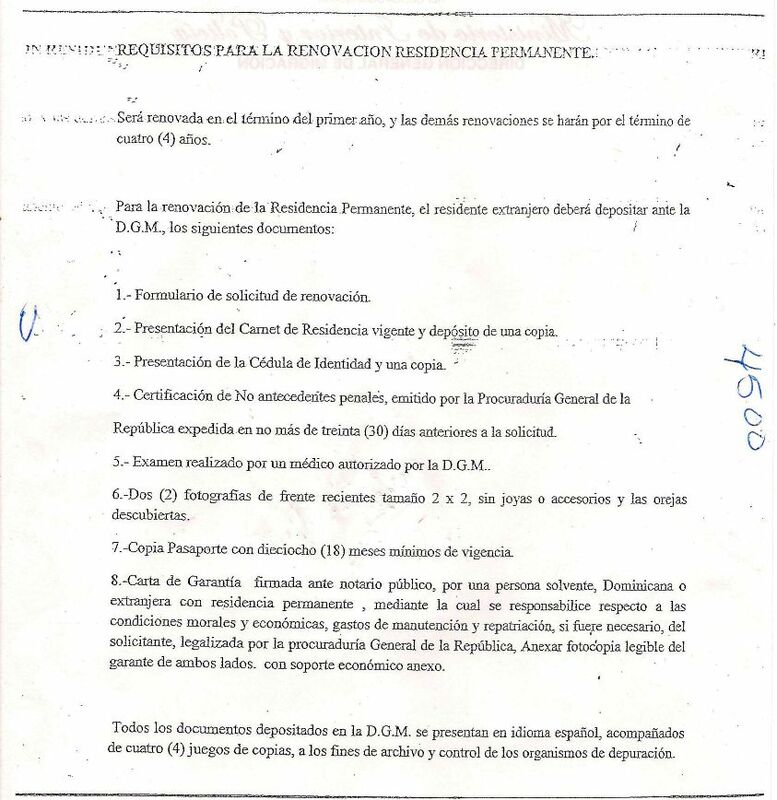 My husband sent in his old cedula in july and got his renewed under the old laws…by a lawyer and paid like RD$ 4000. I was too late and had to go through the same hassle as you did BUT I used a lawyer. I would definitely recommend spending the extra money and have a lawyer take care of everything for you. I think, better is we leave this “paradise”. Sometime it is like a hell. All paradise places have their drawbacks. I still prefer this country. The hassle is worth it for me.